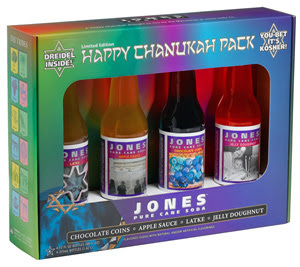 He'Brew Beer has always been a favorite beverage of ours, but for those under 21, Jones Soda just came out with this awesome limited edition Jones Soda 2007 Chanukah Pack with flavors Latke Soda, Apple Sauce Soda, Chocolate Coins Soda and Jelly Doughnut Soda. YUM. More great news - it's kosher. Seems like the perfect beverage for a Chanukah party to us!